God offers Hope to Hispanics! In His pages are solutions to every immigration problem. God loves citizens and immigrants equally. His solutions are for all of us. They are practical. They work. He is not stupid to think so. America needs to pay attention so we can stop kicking thorns barefooted (Acts 9:6). Keeping the grand promises of the Statute of Liberty are the smartest thing citizens can do for themselves. Mailing to Every Iowa Church 12/18/7: Printable letter size PDF <> PDF of actual 11x17 mailed pages Subjects: How God's Plan Would Work, what it is, Why Man's Plan Cannot Work, statements of denominations, model caucus resolution, photos documenting one way the Mexican government drives its people north. God's Immigration Policy God's Immigration Policy may seem stupid to you, but His works. Yours doesn't. "Mark of the Beast": Why God Cares, Why We Should - "Maybe the thumprint OR retina scans on next year's drivers' licenses aren't just 90% of the Mark on the right hand OR the 'face'". Immigrant ("Stranger") in Scripture A study of 115 Bible verses showing God demands the same rights for immigrants as citizens enjoy, in civil and criminal law, and even in worship opportunity so long as immigrants meet reasonable, attainable criteria. Quotas: Illegal Immigration Quotas: Unconstitutional! Model Deportation Brief Maybe some brave immigration attorney and brave client will use the occasion of a routine deportation hearing to challenge the constitutionality of Immigration Quotas. S1348: Big Brother Bill Selections from the bill, with analysis, showing how The Immigration Compromise Bill, combined with the Real ID Act, would have authorized a worldwide database for all humans to be used for passports and tracking criminals - at first." Driving Down Wages Do we thank our doctors and lawyers for driving our wages up? "Amnesty!" Does anyone care what the word actually means? "Get in WHAT Line?" Get in WHAT Line? For most, there IS no line! Public Schools Public Schools aren't Free for ANYONE!" "The High Cost of Cheap Labor" Reviewed If the study hadn't counted citizens as "illegals", it would have concluded illegals contribute $10 billion MORE in taxes than they receive in "services"
Should babies of "illegal aliens" born here be counted as citizens? "NO!" shout many Americans today, such as Pam Slater, on the San Diego County Board of Supervisors, who told a Congressional hearing, "We in San Diego County have been exposed, by our local news media, to scenes of expectant mothers in labor circling hospital parking lots in their cars, waiting until the last possible minute to enter the hospital. The child is delivered soon after the mother is admitted, denying authorities the chance to deport the mother. The mother then receives free hospital care, and the baby recieves a birth certificate as a U.S. Citizen, and a Social Security number qualifying him for welfare." One of many problems with ending "birthright citizenship" is that the only way anyone has been able to think of to do it legally is by changing the definition of the word "jurisdiction" in the 14th Amendment. But if it is changed so it affects the birthright clause, it will also affect the "equal protection" clause, which is the only law we have that keeps America from returning to slavery. So while we're asking if "illegal aliens" born here ["drive-by citizenship", some call it] should be counted as citizens, we need to ask this: May we enslave "illegals"? 3/5/05 Press Release from The Partnership Machine, Inc. 3/5/05 Boletín de Prensa de la Partnership Machine, Inc.
"Why is America MoreFree?" ¿Por qué América es Libre y Próspera? Correspondence with King. Congressman Steve King and I have this in common: a reputation for controversial public stands for Biblically defined issues. So then how can he and I disagree on US immigration reform, about which the Bible has so much to say? Here is his December 17, 2003 letter opposing Bush's immigrant-friendly plan, which he got 35 Congressmen to sign, and my three letters to King, questioning him about the facts he alleges in his letter, and following up on a conversation I had in March, 2005 with his Chief of Staff, Chuck Laudner. * The 40-50 million babies we have slain is about the number of Hispanics who have tried to replace them. The Hispanic population in the U.S. grew from 9.6 million in 1970 to 35.3 million in 2000, 58.5% of whom were Mexican. Based on spotty estimates that the Border Patrol has apprehended about half who have tried to cross, the roughly 10 million "illegal aliens" we have now would become 20 million legal workers, if we would let them. * America's refusal to let 40-50 million Hispanics legally join our workforce, to replace our own sons whom we have slain, is our second rejection of the help God has sent to care for us when we are old. Our Social Security system would be in no danger had we not slain 50 million of our young, and it will still be in no danger if we allow 50 million Hispanics to work legally. * "Overpopulation" is a straight-from-Hell rationale shared by abortionists and anti-immigrationists. * The dehumanization of calling babies "blobs of tissue" is nearly matched by the dehumanization of calling undocumented immigrants "illegal aliens". "Aliens" has been the legal term for "non-citizen" for generations, but with its use to describe space aliens, it now connotes something not quite human. Now we add the word "illegal", to describe what our own great grandparents did legally and naturally, and if they hadn't, we would not be here today. So the connotation of "illegal alien" is "a criminal who is not quite human". The emotion of this connotation is not lost on those who use the term, who seldom use it respectfully but usually as a slur. * America is divided over the issue for moral reasons. Anti-immigrationists accuse Bush of promoting his Guest Worker Plan "just to get Hispanic votes", but the political reality is that he stands to lose more votes from his conservative base, than he hopes to gain from Hispanics. They accuse Democrats of wanting open borders just so they can get Hispanic non-citizens to illegally vote for them, but Democrats' openness to Hispanics may be accounted for by compassion such as manifests in Catholic charitable services to Hispanics. The division over the morality of this issue is so entrenched that entire government bureaucracies will not report known undocumented immigrants to the USCIS. Often the reason is that Congress wants certain vital services available to their citizen children, and does not want those children neglected because of the parents' fear of deportation should the service agency report them. * God has spoken as clearly for the humanity of immigrants, as He has for the humanity of the unborn. Just as prolifers can quote Luke 2, Psalm 139:13-16, Jeremiah 1:5, and passages about Molech worship, pro-immigrants can quote verses about having "one law for the stranger [foreigner] as for yourselves, for "ye were strangers in the land of Egypt"; or, we might say today, "you would be the children of illegal aliens yourselves, had your fathers, when they came to America, been forced to climb over the quotas you impose on your Southern neighbors today." Minnesota Congressman Mark Kennedy's website has an article that says it this way: "Like it or not, Americans will have to live with the fact that while these newcomers are here illegally, they're not going to be deported. They are not fearsome aliens, just the latest iteration in an ongoing immigration drama in which, not too long ago, our parents, grandparents, and great-grandparents were the protagonists." * Our reaction to immigrants, like our reaction to our own offspring, is a litmus test of our longing for Heaven. Matthew 5:43-48 explains that even the wicked love those who love them, but the test of love is when you love your enemies, as God does, sending rain on the just and on the unjust. But when we can't even love those whom God has sent us to care for us in our old age, how can God expect us to be comfortable in Heaven? In Matthew 25, Jesus says the way we treat "the least of these my brethren" is how God sees us as treating Him. * The immigration battle now is where the abortion battle was a generation ago. In the beginning of the abortion battle, only a few voices declared what God had to say about it. Fewer took action to save the unborn. It took 10 years for the issue to reach national consciosness as an important political issue, and many more years before it was entrenched as front burning political issue to the extent that the issue decides many elections. We stand now at the beginning of the spiritual battle over immigration. Unlike abortion, where babies immediately started being slaughtered by the millions, the immigration flood has gradually become a problem, as the desire for freedom has gradually overwhelmed our quotas on how many are allowed to be free. So only recently has it become clear that this is a spiritual battle. But the Supreme Court is not a factor this time, and even if it were Congress is about to start standing up to the Supreme Court, so this battle need not take a generation to resolve, this time. (This article is Dave Leach's original, 2002 article, covering some of the same issues as "The Recipe..." above with simpler, more general arguments. This article was published in Dave Leach's campaign newspaper when he ran for State Representative in 2002. An example of its different approach: instead of challenging the myth that "illegals come here to get welfare", it points out why welfare not only has never, but can never provide for the needy as well as getting the government out of welfare, so Hispanics should stop voting for Democrats who want to perpetuate this albatross which is the biggest reason their friends across the border aren't welcome. This is the official transcript of the U.S. House subcommittee on Immigration, which studied, in 1997, whether children born in the U.S. of parents not legally here are citizens, according to the 14th Amendment to the Constitution. The copy here has the "meat" highlighted in red, and the irrelevant portions in a smaller font. My own editorial comment is in blue. A job that will capitalize on acquired expertise and experience. Bachelor in Journalism with 9+ years' experience. Specialty in essay. Coast-to-coast radio show host two years. Skill with elaborate information analysis and synthesis. Experience producing radio spots inspiring personal achievement and human values. Aptitude for quickly integrating an organization, assimilating employment requirements easily, as well as new ideas, concepts, methods and technologies. Energy and self-motivation to be part of a team. Ability to manage multiple and different responsibilities. Professional objectives focused on any task involving imagination and creativity, as well as challenges and special projects. Coordination of groups of teenagers theatre preparatory classes four years. Coordination of students in composition and essay labs three years. Predilection for tasks developed through teamwork. Facility with humor to keep situations in perspective, without underestimating problems. a) I did cover stories and wrote about movies-premiers, open plays, exhibitions and concerts. b) I interviewed many Mexican Show Business personalities. c) I was in charge of reviewing movies nominated for the 1994 Oscars. d) 20th Century Fox selected me for an all-expenses-paid trip to Beverly Hills to enable me to cover the premier of Baby's Day Out, including an interview whith Glenn Close, Willy Nelson and Olivier Stone. e) I coordinated reporters, giving them assignments, and correcting their styles. a) Chronicler, interviewer, arts critic and news reporter. (This department closed in 1993. I don't know how contact him). Chief: M. Carmen Castellanos C.
Address: Orizaba 136, Col. Roma, C.P. 06600, México, D.F. a) In charge of coordinating articles and advertisements for the magazine of Chemical Engineering, besides designing the calendar of events organized by the Institute. a) Daily analysis of all newspapers of the country. The analysis included national and international news, as well as industry-related news from around the world. b) Production of spots of radio for the show Mujer, a coproduction of ASPA and the Radio Mexican Institute. c) Writer for the internal bulletin Bitacora. Chief: P.A. J. Raúl Cárdenas A. Address: Palomas 110 3rd Floor, Lomas de Tecamachalco, México, D.F. a) This publication was distributed in all retail stores in Mexico that sold recorded music. The content was about music recording in Mexico, as well as news and interviews with personalities and famous singers. Address: Mora 5 A, Col. Valle de los Pinos, C.P. 54060, Tlanepantla, Méx. a) Host of Zero Show whose duration was one hour daily.It was an entertainment show. b) Main host of the program Gabriela's Reports (Los Reportajes de Gabriela). The subjects treated included overcoming personal problems, and human values. c) At the beginning of 1987, I was named main host of Zero Show, which closed the station's broadcast day at the end of that same year. 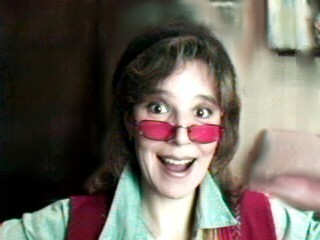 · In 1995, I took part in The Novel Contest in Publishing Planet with the Novel named ?Headline?. · In 1997, I wrote the novel ?The Promise?. It hasn't been published yet. · Actually, I?m writing another novel: ?One flower by the sun?. LET ME KNOW IF YOU NEED MORE REFERENCES, PLEASE. Join our FORUM on any article posted here. The discussion board set up at http://x.saltshaker.us/forums is designed for you to respond to any article on this website. (Or start a discussion on your own topic.) To respond to any article on this website, just copy enough of the beginning of the article to let everybody know to what you are responding, along with the url of the and then have at it. Would you like us to email new articles or forum "threads" to you? Let us know!